Lynx Heli Innovations has redesigned the standard 130 X plastic tail servo support, using aluminum alloy. 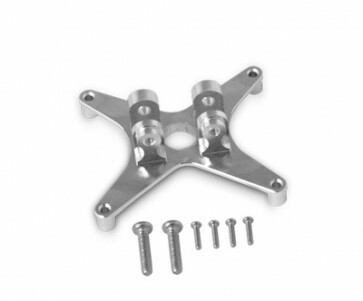 We designed a single X shaped plate that supports the tail servo perfectly. Like any Lynx part we aim for the strongest part with the lightest weight. We always look for upgrades that will not compromise helicopter performance. The details and design of this tail servo support add top performance and an exotic look to your 130X tail system. - Direct replacement for the standard 130 X tail parts. - Increased rigidity of the tail servo improving tail system performance. - Tail servo support material: Aluminum 7075-T6 - clear anodized finish.